Commercial sugar cane juicer machine, sugarcane juice extractor, sugarcane processing machine, sugarcane juice machine, ganna machine. 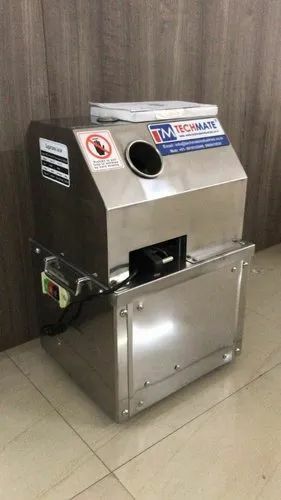 Stainless Steel 3ruller Automatic Sugarcane Juice MachineMaterial - Stainless steel 304Ruller - 3 Stainless steel (95% extraction)Per Hour Out put - 200-300kgMotor - 3H.P (800w) Made in TaiwanPlaces recommended for this juice shops, hotel, restaurants, homes, etc...Easy to clean and use. Techmate Industries established in the year 2014, Since our incorporation in this domain, we are actively engaged in Importer, Manufacturer, Exporter, Wholesaler, Retailer, and Trader of the superior quality array of Pantry and Baking Equipment to our clients. Our comprehensive range of products includes Bakery Oven, Bakery Equipment, Planetary Spiral Mixer, Refrigeration Equipment, Coffee Machine, Commercial Blender and much more. All manufactured products are made as per the industry set norms in various technical specifications to cater the requirements of our valued clients. Owing to their high performance and long functional life, these products are highly demanded by various food industries. Apart from this, we are offering our products at budget-friendly prices. Our product range is developed by using only premium quality components. Offered products are available in various specifications as per the detailed requirements of our valued customers. Our products are made under the guidance of our highly skilled professionals and quality auditors who constantly inspect the quality of the provided products against various parameters. Our facility is regularly checked in order to match the current needs of the market.